In this day and age, branding is a key part of pretty much anything with a space. One place that is never considered an opportunity is down below…shoes! We at Driving Impressions are offering a unique opportunity to racers, teams, and companies looking to expand their image at trade shows like PRI and SEMA. The shoes are made of suede leather. Your logo would be screen-printed into the shoe’s side body panel, while the suede arch insert and piping are matched to specific chosen colors, would be inherent in the materials used. The flexible black rubber soles feature a tire tread pattern underneath. They can also be retailed on your website, as many of our customers do. The retail price is generally $79.99, which leaves a substantial profit margin should they be ordered in a half dozen pairs or more. 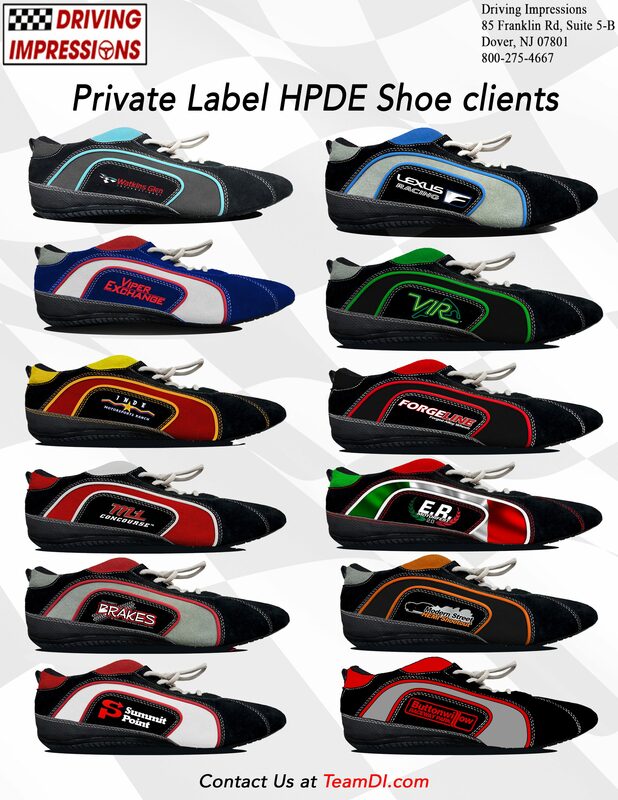 We also build custom one-off pairs for private clients looking for a one-of-a-kind pair of motorsport shoes. Pick your favorite colors to match your rides exterior/interior, favorite sports team, or anything else you have in mind! Any questions, please email bobz@teamdi.com or call 800-275-4667.